to the Doctor Could Inspire a Web Site? ast year, I had trouble bending over to make the bed, what I thought was "normal aging". My wife appreciated my feeble attempts to help. In reality, I was slowing her down—she was only 50 and stronger than I was. That was last year. This year, I swam for 40 minutes, skied 15 minutes at 6 miles per hour on a cross-trainer, then worked out for 45 minutes with free weights and machines. Later, my wife and I went out to celebrate. Whew! I could not have done that at age 50 because by then I had already abandoned physical activity for TV and the soft life. One year of my program has allowed me to regain flexibility, endurance and strength and to shrink my waistline from 37 to 32 inches. Muscles that disappeared twenty ago have reappeared. Other muscles have popped up that I have never seen before, including the beginnings of a six-pack. I believed from the start that I would succeed, but never hoped to hit the jackpot. My name is Fred Colbourne. A little over one year ago, I faced a serious challenge to my health. Frankly, I was frightened. In fact, the first thing I did was panic. When I had calmed down enough to do some research about anti-aging strategies, what I found convinced me that the same systems science I had practiced all my professional life could solve health problems most people attribute to aging—problems that are caused more often by poor nutrition and inactivity than by aging itself. I discovered that, although "aging" has special meanings for scientists, more often "aging" is shorthand for ignorance and inertia, and "anti-aging" is shorthand for cosmetic products and services. We base our beliefs about "aging" on traditional social and cultural expectations. As we get older, we allow ourselves to decline because we mold ourselves to the stereotypes we have learned from our parents and our grandparents—we follow negative aging models. To combat aging we need to find positive aging models and to mold ourselves to new mental images of health, fitness, and appearance. To combat aging, we need to erase the old mental program with its expectations of decline and decay and replace it with a new mental program with expectations of renewed fitness and vitality. That's what I did: I found a role model. 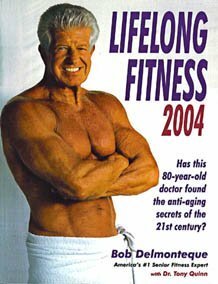 Dr Bob Delmonteque, America's top senior fitness consultant, inspired me to change my life to regain my fitness, vitality and health. At 84 years of age, Dr Bob runs marathons, cycles 120 miles, and bench-presses over 250 pounds. I Wondered . . . Does Dr Bob's approach only work for people who have been fit all their lives? I have read Bob Delmonteque's book. More than that, for the past year I have lived the book and I know that what Dr Bob says works, even for people who have let themselves go. I didn't have proof when I started. I just believed. I didn't say to myself, "But he's been doing it all his life. It's too late for a broken down old nag like me." I just started doing it. Soon after I started my recovery program, I discovered that others too have decided to take control of their lives. Marty, a fitness champion and a grandmother is one of 50 role models featured in Fit Over 40, co-authored by Jon Benson and Tom Venuto. Role models are not enough—we need knowledge too. When I read Fit Over 40, I discovered that one of the co-authors, Tom Venuto, had written a detailed guided to losing fat and regaining muscle, Burn the Fat, Feed the Muscle. I downloaded Tom Venuto's e-book, printed it out. By my own research, I verified that Tom's approach is scientifically sound and doable. When I began, I didn't know how or when I would find a practical anti-aging strategy, but I committed myself and never doubted. What I learned enabled me to reduce my cholesterol 36% without drugs in four months. The reduction in LDL (the "Lousy" stuff) was 42%, a greater reduction than claimed for statin drugs. I also shed 40% of the body fat I was carrying, without dieting and without drugs. My blood pressure fell to the normal range. Side effects? I had to buy new trousers because the old ones didn't fit anymore. No wonder he was impressed: this year, the maximum workload was 14.0 METS, double the 7.0 METS three years before, and even better than the 12.0 METS reached at age 59. When I first visited the doctor, my heart was aging faster than the rest of my body. After one year, my program increased the fitness of my cardiovascular system to what it had been 15 years earlier. The doctor said, "You ought to be on TV," laughing. "I can't afford to buy a TV station ... Maybe I can do a Web site." And that's what got me started planning this Web site. What keeps me going is my commitment to reveal to you how I transformed an aging and decrepit body in one year without drugs and how you can improve your health and fitness too. Bio: For the past 40 years, Fred Colbourne has advised corporations, governments and international organizations on assignments in more than ten countries, applying systems science to problems in telecommunications, electricity, gas utilization, oil pricing, water supply, irrigation, road transport, airport and seaport development, industry, and urban infrastructure. He got his start at London University as a senior operations research scientist and later as a principal scientist for the UK government. Fred was born in Toronto, Canada, in 1931. He has a B.A. from the University of Western Ontario, an M.A. in social science from Miami University (Ohio) and an M.S. in physical science from Emporia State University (Kansas). He lives with his wife in Penang (Malaysia) and London (England) and still does short-term consulting work. This is NOT a story about how a 74-year old went from not knowing how to turn on a computer to building a Web site overnight. I started writing computer programs 40 years ago, long before the Web existed. In 2000, when I started my M. S. degree, I built a Web site to present my assignments, writing all the HTML code by hand. My last Web site was for my professor and me. I even put in special code for the search-engine robots, "NO_INDEX, NO_FOLLOW", in other words, "BUZZ OFF". But that's not how I built this Web site and I'll show you why by inviting you backstage to see how it's done. I promise that I won't bore you with the technical details. Do You Do It For the Money, Honey? In his book On Writing Stephen King asks himself the question, "Do you do it for the money, honey?" His answer, "No. Don't now. Never did." And I believe him. As a consultant, I've written a lot for pay, but never thought about the money as I struggled to find the right words, fix sentences and get paragraphs in the right order, and I suppose that's why I believe Stephen King. You get a feeling of fulfillment when you get things right, a reward in itself quite apart from money. I started this Web site to spread the word that aging does not have to mean physical weakness, mental debility, and chronic disease. I wanted something different from the modern equivalent of "snake oil" that I saw all over the Web—con-artists preying on our hopes and fears. Even if it meant that I would do a lot of work researching and writing and not get paid for it. What I did not want was to do a lot of work and end up with only a few visitors—like the Web site I built for my professor, with only one reader! I could have gone back to the service that hosted my previous site. They are reliable and cheap—only 26 cents a day. But I would still have to write all the HTML code and learn how to attract visitors. Plus, I would have to get involved in all the technical details of search engines, subscriber tracking, newsletter mailouts, implementing RSS/XML (for blogging)—the list is as long as your arm. When would I get time to research and write articles? When would I get time to exercise? Preparing snacks and meals takes time too. Would I be tempted to eat factory- processed food again just to save time? I could see that using a bare-bones Web service was not going to work. If I wanted to help people improve their health and fitness, I had to maximize the time for writing articles. That's when I found Ken Evoy, a Canadian medical doctor. Dr. Ken has developed a simple approach to creating Web sites and attracting lots of visitors. Dr. Ken's system, called Site Build It!, is usually used to build successful small businesses on the Web. But why couldn't I use SBI! to build my inspirational site? With SBI!, I would have time for research and writing. Think about it! Who can afford to hire an IT professional to build a Web site and generate traffic. And it's hard enough to start up and manage a Web site without having to learn Web design, HTML and Web marketing. SBI! makes it possible for one person to set up and run an inspirational site or a small Web business, with no gimmicks, scam or spam. I knew Site Build It! was just what I needed to avoid getting wound up in technical details. When you click the image above, a new window will open. Look for Growth & Self-Reliance, the story of a 15-year old girl who used SBI! to start a Web business—with a little help from her dad—a business that will finance her college education. SBI! 's price is right too—82 cents per day, just 56 cents more per day than the bare-bones service I used before. With SBI!, I don't have to fiddle around with HTML or any other technical aspects. For that extra 56 cents, SBI! takes care of everything, leaving me free to do what I love: researching and writing for Combat-Aging.com, working out in the gym and at the pool, walking in the park with my wife, and preparing healthful meals for both of us. Just imagine! If you wanted to start a business like these other folks, your total cash overheads would be 82 cents per day! For your cash flow to break even, that's all your business has to earn. And what do you get for the extra 56 cents you pay above the "bare-bones" service of other internet hosts? Top notch support by competent friendly staff and fast turnaround times. PLUS, the most active small business forums on the Web. Recently, Dr. Ken added blogging to the many SBI! features available. I was able to add the RSS/XML option to my site without knowing the technical details. I read the manual and wrote a page to explain RSS to my readers. Then I wrote a few paragraphs as an introduction to my blog page. From start to finish, the total time for getting RSS up and running was about five hours, including reading the manuals. I still don't know much about RSS, and what I know about XML would fit on a small postage stamp. With SBI!, it doesn't matter; you don't need to know. Now every time I write a new page or add a blog item, the RSS feed is updated automatically. With "site-blogging", as implemented by SBI!, all the pages in your whole site become blog items that are updated every time you add a new page. No time to do a whole page about a breaking news item? Just add a new entry linking directly to the source of the news. That's as easy as it gets and nobody else offers it, except SBI! There are hundreds of SBI! user sites that rank at the top of the major search engines with thousands of visitors each day. From all over the world SBI! SBI! experts contribute to the Solo Build It! forums explaining to novices how to get started and how they developed their own businesses. The Solo Build It! forum is probably the most active small business community on the Web, with dozens of people on-line at any time. Eventually, we will move to a smaller condo more suited to retirement than the one we have now, a place with handrails and ramps for the elderly. I suppose some day, my wife and I will need the handrails and ramps. For now, and for many years to come, we expect to make good use of the fitness center, the swimming pool, and the track. Now that's what I call active retirement: study, writing, swimming, and working out. When will we ever find time for TV? 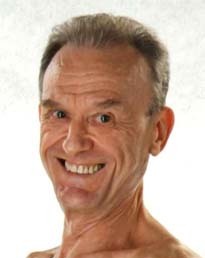 I wanted to share my approach to lifelong fitness and health and to report the experience of others who have similar stories to tell about their anti-aging strategies. There is a site that is very revealing. It's called:Solo Build It Scam Site. It explains how easily competitors can use Google bombs to get what they want. It's not good and it could happen to anyone. Check out that link to find out more.